The following is a brief comparison and construction review for seven injection-molded plastic models of the WW2 era American 2.5-ton truck. Discussed are the three veteran Hasegawa General Motors Co. kits, Cooperativas/AERs Studebaker Model US-6 cargo truck, Airfix/Hellers new GMC kit, and PST Models Studebaker and GMC truck kits. The 2.5-ton truck came about through a US military need for the largest capacity truck that could be produced in large numbers, to supply all US needs as well as for export to Lend Lease allies. Production was largely split between GMC producing trucks for the US Army, Studebaker Company producing 2.5-ton trucks for Lend Lease, and International Harvester producing for the US Navy & Marines. 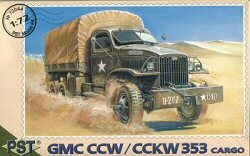 There was some crossover and both GMC and International Harvester deuce & half trucks could be found in Soviet use. The 2.5-ton trucks produced had largely interchangeable parts; the most readily visible differences being in the cab and locations of the fuel tanks and spare tires. Three primary manufacturers produced over 900,000 2.5-ton trucks in all, in both 6x4 and 6x6 versions. Under Lend-Lease they were supplied to the armed forces of Great Britain, Australia, France, the USSR and Poland, etc. Variants included short wheelbase trucks for use as prime movers (artillery tractors), with and without winches on the front bumper, box vans, and fuel & water tanks carriers. Models from 1941 to about 1944 had all-metal civilian looking cabs (represented by Cooperativas and PSTs models). In 1944 a less resource & time consuming soft-top military cab was used for all three manufacturers. 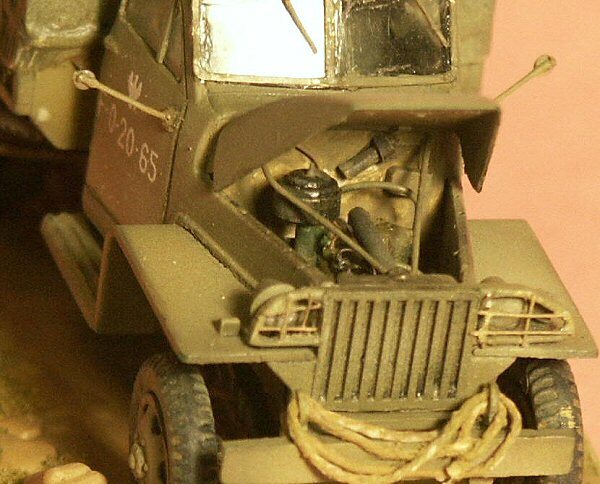 Airfixs and Hasegawas kits represent the military cab. 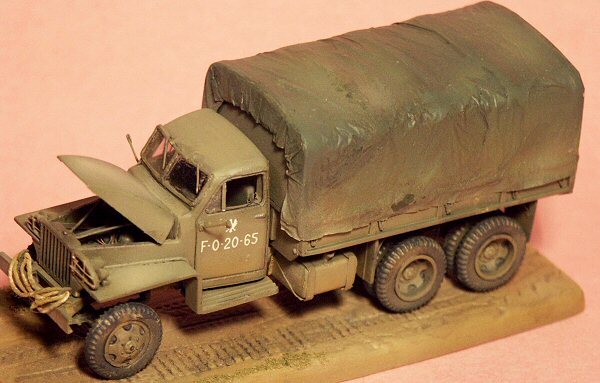 I understand that Academy will soon release 1/72 scale GMCs in both the hard cab and the military cab. 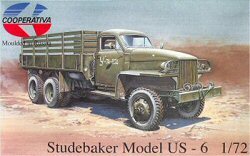 The AER/Cooperativa Studebaker US-6 kit is for a while was our only option for a Studebaker truck and early all metal cab. Overall this limited-run kit is not up to todays molding and design standards for a fine display model but does have some very good attributes such as the overall shape of the cab, and the wheels are more accurate than that of Hasegawa.. Problems include: no headlights, no steering wheel and overly-thick parts. The Eduard etched brass detailing fret for this model helps considerable in improving it. 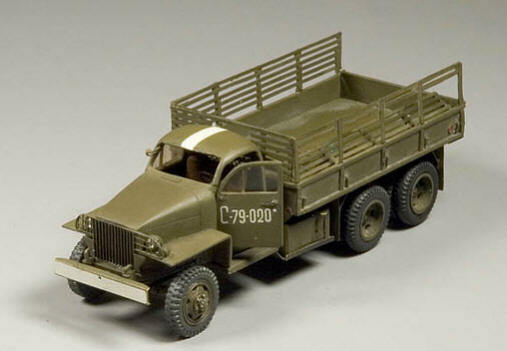 Hasegawas GMC trucks share easy, solid construction and the same basic parts except for the beds. Hasegawa is the only company at this time that offers dump and fuel tanker versions (except for the PSTs BZ-35S exception below). No clear windshield material or towing pintle is included. These truck kits have been around since the 1970s and have greatly simplified cabs and suspensions. Hasegawa offers crew figures with their kits. Decals are for a single star and three different sets of vehicle numbers. The Hasegawa cargo version offers a canvas cover. The PST kits are a considerable improvement over the Hasegawa and Cooperativa models. 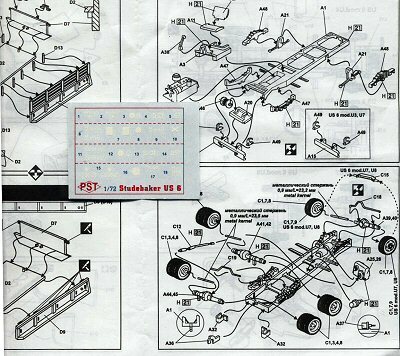 The kits share three common sprues for the chassis, bed and wheels & suspension. In the GMC kit we get a GMC cab, in the US-6 kit we get the Studebaker cab. Common to both PST kits are the engine hoods (bonnets), front fenders and fuel tanks for both the Studebaker and the GMC trucks. All the PST cargo kits come with decently molded canvas covers (tilts) for the cargo bed. No clear windshield or windows were in my kits, though a recently purchased PST truck kit included a new sprue of clear windshields and windows for both trucks. The PST M-7 and M-16A kits have a sprue for a fully enclosed box body instead of the cargo bed. The box body is well detailed and offers choice of open or closed doors (no interior detail is included). PSTs BZ-35S kit has the fuel tank bed from PST Zis-6 fuel tanker that the Soviets modified and used on the Studebaker US-6 chassis. PST offers a separate engine hood that is easy to model open and show off the engine. The same engine is included in both GMC and US-6 truck kits even though my references show that GMC and Studebaker used different engines. PST also gives us the option of making the 6x4 or 6x6 versions, and with or without the front winch. All the other kits require some major surgery and scratchbuilding to get a different variant. 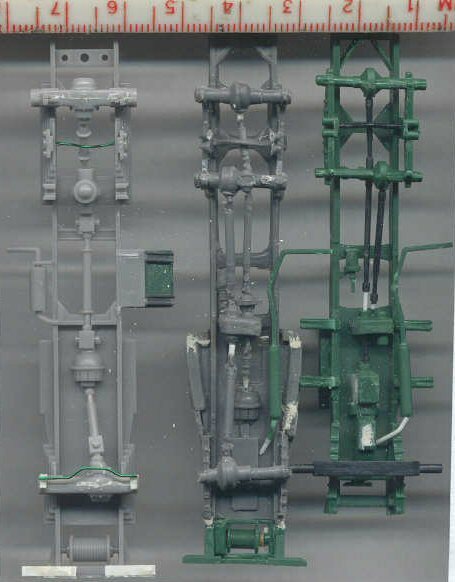 Above is a side by side comparison of the gray Coorperativa truck frame at top, the green PST frame in the center, and the light gray Hasegawa frame at the bottom. Looking at them you would not know there were for the same truck! The Cooperativa frame is representative of the rest of the Cooperative Studebaker kit: soft detail, inaccurate detail and lots of flash. This is a mightily challenging kit to build into a good display model. The green PST frame is a considerable improvement though we note a few sink holes in the bottom of the engine area. The Hasegawa frame at the bottom has sharp molding though is very simplified compared to the other kits: note the molded-in leaf springs. The Hasegawa kit is considerably longer and wider than the Cooperative, PST and Airfix truck frames. 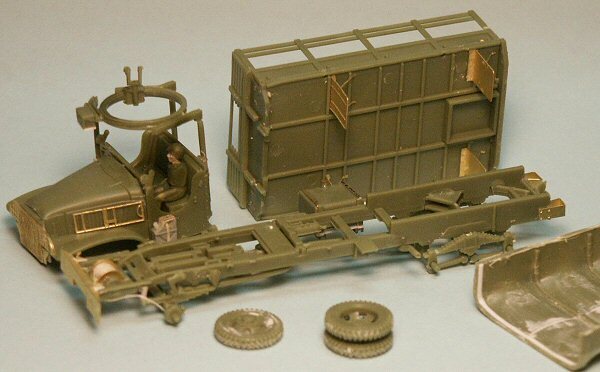 Above is a comparison of the (partially assembled) light green Airfix GMC frame above the dark green PST truck frame. Despite that the winch assembly is not yet installed on the PST frame it is still evident that the Airfix frame is a little longer and wider. The Airfix frame has my vote for the most accurate and detailed of the four manufacturers. Above is a scan (left to right) of the partially assembled Hasegawa, Cooperativa and PST frames and drivetrains. The Hasegawa kit represents an incorrect simplification of the drivetrain and axles. Cooperative gave us the Split Type axles. The PST and Airfix have the Banjo Type axles. The Split Type axles and the Banjo Type Axles were built and used in roughly equal numbers. Note also that I built the PST model as a 6x4 drive (no front drive axle) and without a winch. The Hasegawa and Cooperative kits are built as 6x6 drive. 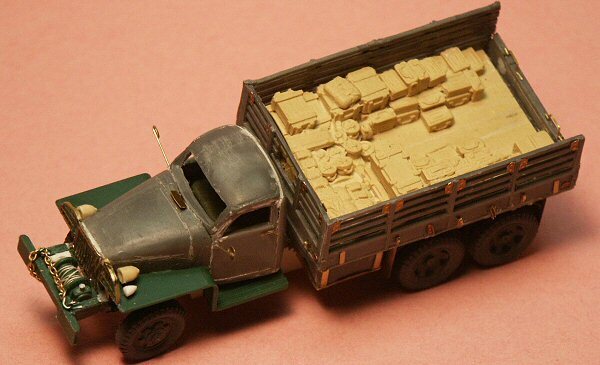 Despite all these deuce & half truck models being advertised as 1/72 scale, every one of the four has different dimensions! This is evident in the Airfix and PST cargo beds. PST had annoying sink holes in their truck bed. 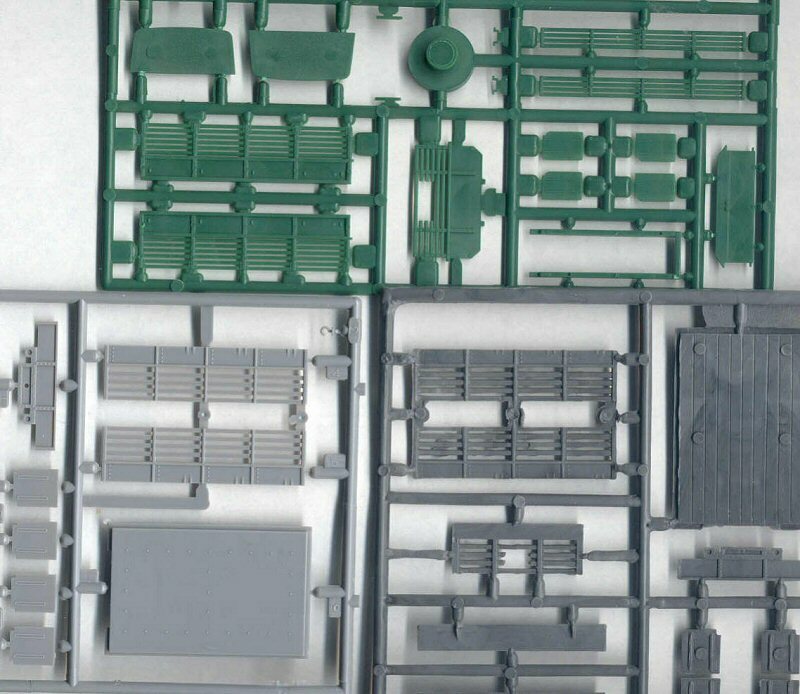 In the above scan of sprues from the PST, Hasegawa & Cooperativa you may be able to see that PST and Hasegawa offer the sharpest molding. PST and Airfix also give us a wood bed. Cooperativa gives us a wood cargo bed (with big positive ejection pin marks). Hasegawa features a steel cargo bed. The light gray Hasegawa truck wheels at far left are slightly smaller than the other manufacturers despite the overall kit being larger. Hasegawas front wheels suffer the same mistake as Airfixs: only five holes in the rim rather than the correct six holes. In over fifty photos I have never seen a five-holed rim. This is truly an odd thing for Airfix and Hasegawa to do. If someone can exhibit a photo of a GMC wheel with five holes, please do. Hasegawas rear wheels have no vent holes at all. Cooperativas wheels are correct but molding is mediocre. PST appears to have the most accurate front wheels of the four kit manufacturers and has separate tires from the rims. 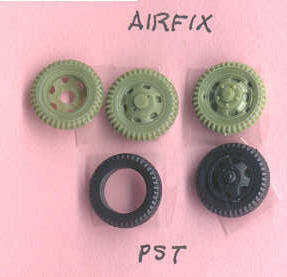 Airfix appears to have the best rear wheels and both Airfix and PST have the best spare tires. All these wheels suffer the same common problem with injection molded styrene tires, that of poor tire tread pattern. 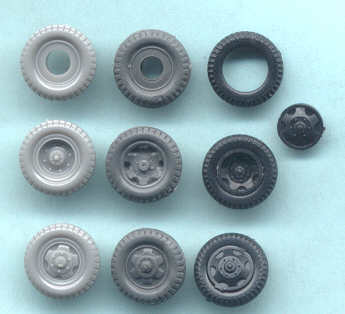 Accurate cast resin tires, such as those offered by Milicast, would be most welcome. Airfix also has nasty sinkholes in their front wheels that will be very difficult to fix (thank god for mud & snow?). Airfix offers good kit instructions and multiple line drawings. Above are nice drawings showing the placement of the water slide decals. Airfix offers markings for only one truck but there are a lot of markings, a vehicle in the famous Red Ball Express during the summer and autumn of 1944 in France. I am unfamiliar with the decals offered in the Heller release of this model. Airfix and Academy are the only kits at this time offering the AA machine gun mount. Contrary to the Airfix box photo, no 5-gal. Fuel cans are included in the box (These are available from LEVA and in Academys GMC and Jeep-Kubelwagen kits though). Above left is a part of PSTs instructions and water slide decals for their GMC truck model. PST gives us markings for three different trucks including the US Army and the Free French Army. Above right are the instructions and decals for PSTs Studebaker US-6 models. 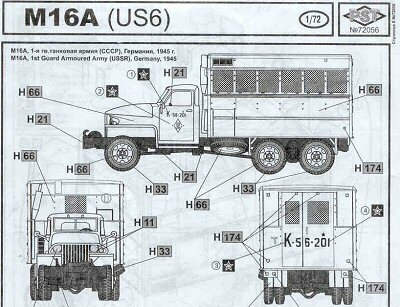 There are markings for four different Eastern Front cargo trucks, and markings for one Soviet M16A machine shop truck in this kit. The van version of the Studebaker and GMC has a box of six parts and gratefully has the rear door and windows separate so we may open it up. No interior details are included so here is a wonderful opportunity for and aftermarket detail set. Above is the old Eduard etched brass set Catalogue #: 22020 . This is a great brass set than be used to dress up any of the GMC and Studebaker kits. The front grill I found much to delicate and easily bent out of shape. The Extra Tech etched brass frets does not offer us as many small parts as Eduard did but offers us parts that Eduard did not. This is a must have for a great display model. Included are a new steering wheel, headlight guard, rear mudguards and windshield frame. A nice addition is the tool bracket that went on the side of the engine. Two front bumpers are offered: one for a truck with a winch and a version without winch. The brass windshield frame is unfortunately too large for the cab as can be seen in a photo below and is therefore best be modeled open. Yes, all these trucks have the windshields hinged at the top and so were designed to have their windshields open for ventilation. Its regrettable that Extra Tech made it too large as the windshield is most commonly seen closed in period photos. The brass slatted sides and bench seats are of questionable value as they appear too thin to me though Ilya Grinberg feels they are very accurate and has used them in his beautiful Studebaker kit-bash. AER/Cooperative Studebaker US-6 U4, 6x6 & with winch, about 18,800 built. Note the significant model putty to get the cab together. The cab doors can be left open. Eduard etched brass has supplied mudguards & braces, headlight guard, rear bumpers, small fittings around the bed and fuel tank brackets. The LEVA Productions resin cargo accessory (Kit #72 E 10) is designed for the Hasegawa GMC but fits well in the Cooperativa model. Extra parts from the PST GMC kits have supplied the front bumper and winch and the front fenders. The headlights were scratchbuilt from plastic sprue pieces. I agree with Ilya Grinbergs assessment that the Cooperativa cab has the most accurate shape for Studebaker kits in this scale. The LEVA Productions resin cargo accessory (Kit #72 E 10) is designed for the Hasegawa GMC KIT but fits well in the Cooperativa model. The larger fuel drum is from MarS Co. Extra parts from the PST GMC kits have supplied the front bumper and winch and the front fenders. The headlights were scratchbuilt from plastic sprue pieces. Because of the softness some details, and as a change from the other trucks, the Cooperativa kit was heavily weathered with a black and brown washes, oil pants, light spray of acrylic paint and pastel powders. Some vegetation is added to cover up a severely bent etched brass grill. 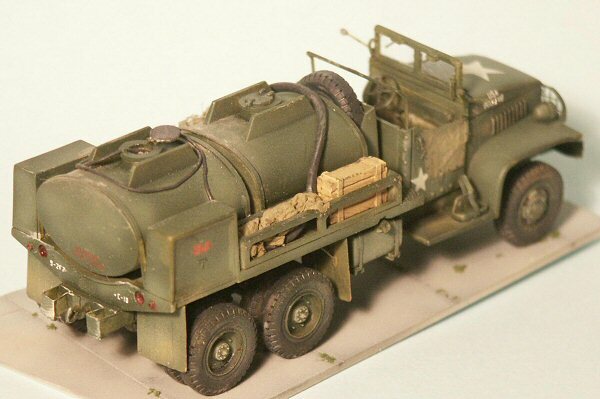 The Hasegawa GMC-353 D 6x6 750-gal. Capacity Gasoline Tanker has a completely re-built cab interior from the seat to the floor to the instruments. Tie-down bands were added around the two tanks. The front bumper winch was detailed before I read that this version of the GMC did not have a winch, prompting me to cut the winch off and replace it with an Eduard etched-brass bumper. The engine grill with headlight guards, mud-flaps, steering wheel, rear bumpers, and the gerrycan holder are etched brass. On the starboard side of the truck a canvas door was produced from plastic-bag material. The fuel tank is a spare GMC part from the PST Studebaker kit. Fuel hoses are made using two gauges of solder wire. The rear fuel tank was opened up and a new dome cover (manway) scratchbuilt. For all the kits in this review, rearview mirrors were made from brass wire and etched brass mirrors. The model was finished using the post-shading method using Tamiya acrylic olive green and a linseed oil wash. After I completed this model I found a great website that shows piping and valves at the rear that I did not know about! 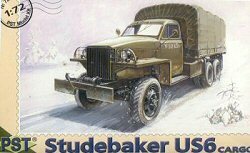 The Studebaker US-6 U7, 6x4 without winch, about 67,000 built. As the PST comes with a separate engine bonnet and rudimentary engine it begs to be left open and detailed. A radiator hose and other hoses, spark plug wires and other sundry details were added based on my references. As with the other truck kits, the rear view mirrors were replaced with brass wire and mirrors from the etched brass fret. In the photo of the unpainted cab not a major problem in the PST cabs: the door is much too thick. Either choose to have the drivers side window closed, or be prepared to skillfully file away much plastic if you wish the side windows open. The headlight brush guards were hollowed out and the frame thinned with a sharp blade. The guard wires, made from fine copper wire, were later added with super glue. Overall they are not near as good as the etched brass light guards. The tarpaulin (tilt) cover for the bed was improved with light-weight plastic bag material attached with super glue, and primed with acrylic primer. Twelve rope tie-downs made from fine thread were added. 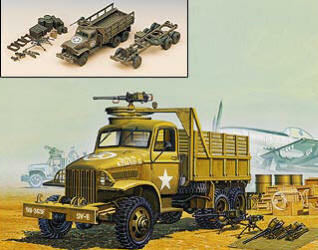 The Airfix GMC 6x6. 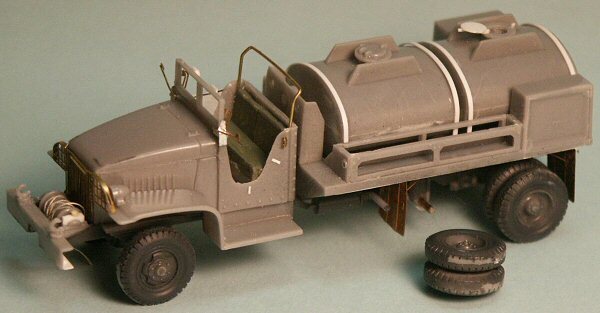 This model is finished with the kit markings for a cargo truck for the famous Red Ball Express in France 1944. The kit assembled well and has the easiest and least complex suspension and drivetrain to assemble. Too bad the front wheels are burdened with the wrong number of holes and big sink holes. The cargo bed looks great and is a wood bed with raised ribs, different from the Cooperativa and PST kits. 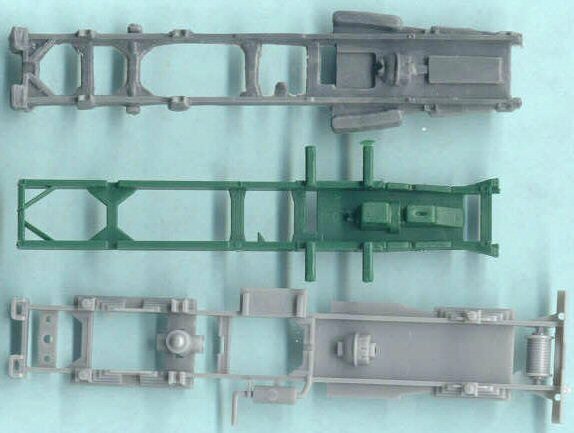 In the above photo of the partially assembled Airfix model we can see the cut down tilt with supports and the added Extra Tech etched brass parts (Tool rack on cab side, front grill, mudguards, rear bumpers). It was at this stage that I did the initial coat of paint so as to get all the hard to reach areas. 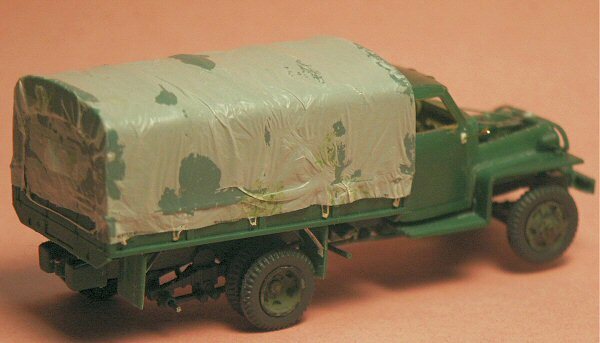 While the other car go trucks kits were done either all covered or all open, the Airfix model was completed as a compromise with the cargo tilt sides rolled up. First the lower sides of the part was cut off. After the inside of the canvas, ribs and the cargo bed were painted the canvas was glued to the side of the bed. Tissue paper was glued on to replicate the canvas and rolled up sides. I regret using tissue paper, as I could not cover up the course tissue texture, even with multiple layers of white glue. Thin plastic bag would have been more realistic. 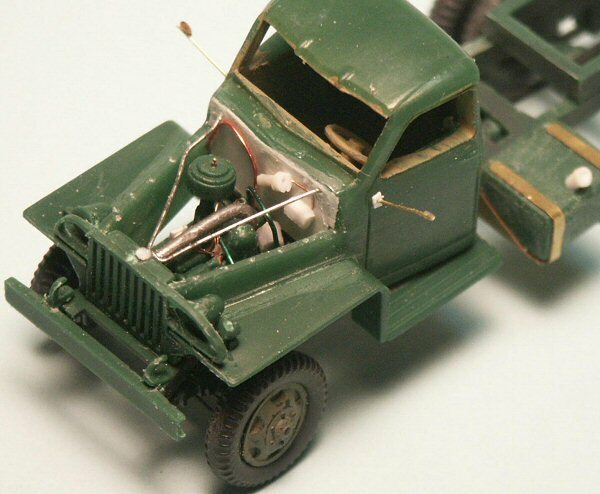 The model appears designed so that we cannot install the machine-gun ring with the canvas top up without sanding the roof down a millimeter or so. After washing the model was painted with dark olive Tamiya acrylic paint, a point wash used and then covered with a light coat of olive drab to blend it all together. The canvas cab doors that come with the kit are molded in clear plastic so all we have to do is mask the windows and paint it the canvas color. The doors are very much too thick and stuck out from the cab side like poor fitting metal or wood doors. For more realism and scale accuracy clear plastic-wrapper material was cut to shape, glued to the cab sides and doors with super glue, the window area masked with taped and then painted. Above is a photo of Academys new 1/72 scale GMC CCKW-353 truck with the hard top early cab, AA machine-gun ring mount, and cargo. Academy offers us yet another choice in GMC variants! 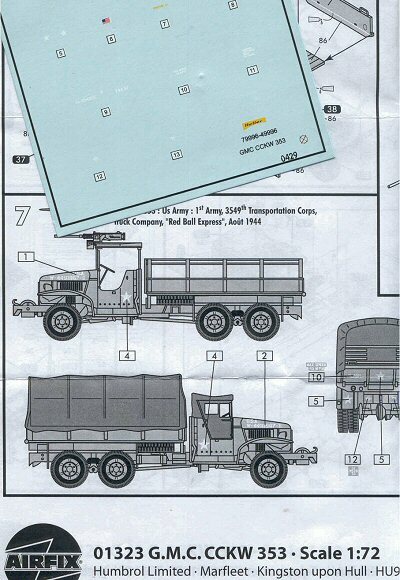 Above are vehicle dimensions from a 1945 US Army publication of the CCKW 353 cargo version at left, and at right the gasoline tank truck represented by Hasegawa. The Studebaker US-6 has the same dimensions. Please note that the cargo truck dimensions at left are for a truck with winch, while the tank truck dimensions are for a truck without a front winch. Based on the above references the kits were measured for overall width, length overall (LOA), and distance between the front wheel hub and the hub of the first rear wheel (142 inches). I found the PST Studebaker to be essentially 1/72 scale for all three measurements. Good job PST! 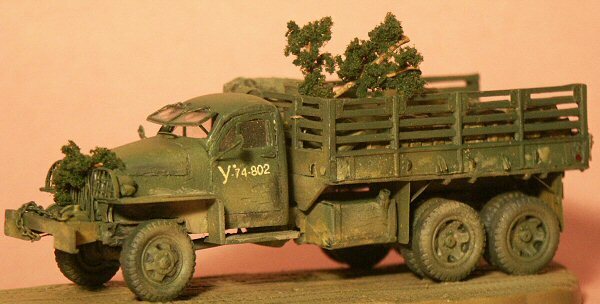 The Hasegawa GMC truck measured at 1/70 scale for LOA, 1/69 for width, but 1/72 scale for distance between the hubs. The Hasegawa kit has long been known to be larger than its advertised 1/72 scale. I suspect it was made to compare with the Hasegawa M4A3E8 Sherman and M3 halftrack kits. The AER/Cooperativa Studebaker kit is the most inconsistent. LOA is 1/72 and the distance between the hubs is 1/71, which are reasonable. The kit width however is 1/69 scale, much too wide. [Skilled modeler Ilya Grinberg has recently taken the best of both PST and Cooperative in combining both kits into a beautiful Studebaker US-6]. As all model kits are a compromise dependent on the skill of the designer, available references and the limitations of the molding process and the medium they are made with; none of the kits are without fault. 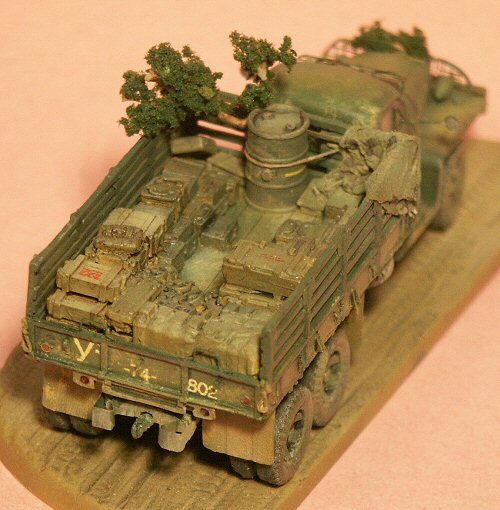 Being the oldest kit, simplified and out of scale, the Hasegawa GMC kits build well, is crisply molded and with a lot of detailing can be built into a superb model. This is perhaps the best choice for a wargamer and novice. 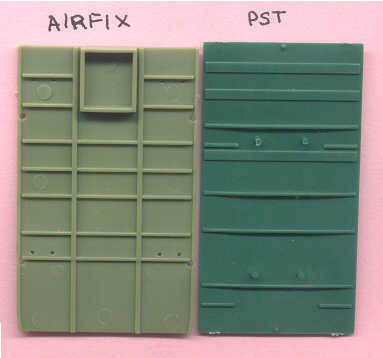 The PST and Airfix models both build into great and accurate models but are more complex. The assembly of the drivetrain and suspension was confusing for the PST and Cooperative models. The Airfix drivetrain and suspension was much simpler and very accurate though the cab was more difficult to assemble correctly. The Cooperativa Studebaker is by far the most challenging to assemble and not the best for a beginner. Unless you love models that are a challenge to build, if you see this kit on the shelf walk away from it. All these truck kits can benefit from better resin-cast wheels. All will benefit from a good etched brass set. Extra Techs set, while good, can benefit from more small fittings that I found in the Eduard fret. The American Arsenal, Greenhill Books (London) and Stackpole Books (Pennsylvania) (1996). This is a compilation of US Army data on everything from vehicles, artillery & small arms to mines and hand-grenades. The Observers Fighting Vehicles Directory, Frederick Warne & Co Inc., New York (1969) by Bart H. Vanderveen. This is a concise but greatly informative book on WW2 era vehicles of all the major combatants by one of the foremost experts on military transport. Unfortunately it is out-of-print.